Playa La Ropa (click to enlarge photo) The slow season in Zihuatanejo is my favorite time of year, especially during the rainy season when tourists are scarce, the beaches are empty, the water is clear (except right after a big rain), the restaurants aren't crowded, the bars close earlier (meaning fewer drunks in boombox cars on the streets at night), and those of us who live and work here get to see each other and socialize after busting our humps during the high season. The slow summer season with its life-giving rains turns Zihuatanejo into a jungled paradise with blooming trees and shrubs covering verdant hillsides. Rivers and streams renew their flow and the afternoon rains keep everything fresh, cool and clean. 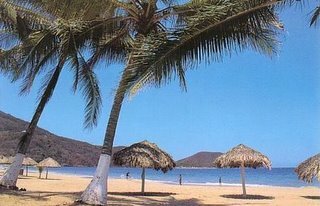 For those who plan on being in Zihuatanejo during the summer rainy season be sure to check out the Zihuatanejo-Ixtapa Weather page. There ain't no summertime blues in Zihuatanejo except blue water and blue sky! Posted by ZihuaRob at 3:59 p.m.